Kenny Bradley (centre), owner of Greens, with actress Sarah Bolger and director Abner Pastoll. It was all about cameras, clapper boards, and ‘quiet on set’ at Greens Food Fare on Sunday as the Lisburn supermarket was transformed into a movie location. The Bow Street store had been chosen as one of the settings for ‘A Good Woman Is Hard To Find’ - a new crime thriller written by Academy Award nominee and BAFTA winner, Ronan Blaney. The crew setting up for a scene outside Greens Food Fare. Set (somewhere) in Ireland, the film revolves around a recently widowed young mother who will go to any lengths to protect her children and uncover the truth behind her husband’s murder. A UK/Belgium co-production (and part funded by Northern Ireland Screen), the ‘Good Woman’ in question is Sarah, played by namesake Sarah Bolger, a 26-year-old Dublin-born actress whose recent small screen credits include The Tudors, The Lazarus Effect, My All American, and Into The Badlands. Directing operations during filming in Greens was Abner Pastoll, a London-based South African whose last project was the Anglo-French suspense thriller Road Games. Greens Food Fare was one of several locations being considered for the film’s ‘supermarket’ scenes. Once approached, new owner of Greens, Kenny Bradley, had no hesitation in opening his doors to the cast and crew. Greens owner Kenny Bradley checks out the director's chair. “It’s great to have Lisburn, and in particular Greens used as a location,” said Kenny. 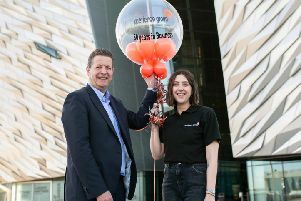 “I think it’s important to support the local film industry and organisations like NI Screen who are helping to bring the focus of attention on Northern Ireland. Both the exterior and interior of Greens came under the spotlight, with a series of significant scenes filmed during a full day’s shoot. And it was most definitely not ‘just another day at the office’ for two of Greens’ employees. Butchers Ashley McClurg and Stephen Lyons can now add acting to their ‘CV’, both featuring ‘on-screen’ as they serve Sarah, the lead character. Shooting a scene at the butcher's counter. Those behind closed doors in Greens on Sunday know how the drama unfolds. The rest of us, well, we’ll just have to wait until the film’s release in 2018. Kenny Bradley, owner of Greens Food Fare, chats with members of the film crew.